1. Decide on the size of the plywood squares by measuring the length and height of your accent wall and dividing into an equal amount of squares. We left about 4 inches in between each square on all sides. 2. Prop the full sheet of plywood up against a table or tree and use the blow torch to bring out the wood grain in the wood. Move the blow torch back and forth slowly over the wood, being very careful not to stop on any one spot or you'll burn right through the plywood! You'll notice that the grain gets almost black as you fire it. 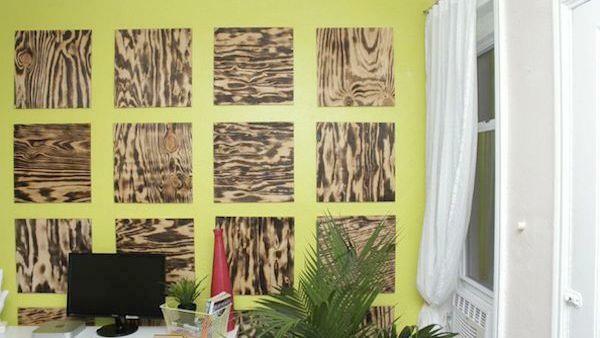 Do this with every piece of plywood. 3. Cut the plywood into squares using the table saw. In our case, we cut the plywood into 18 x 18 inch squares. Sand any rough edges before moving to the next step. 4. Use the measuring tape, level and chalk line to create a symmetrical grid on the wall. You could cover the entire surface of the wall, or do just a section as a modern art piece. It's all up to you! 5. Attach the squares to the wall with a nail gun. For extra adhesion, you could use liquid nails as well, but this will damage the wall if you ever decide to take it down. Keep that in mind, but trust us, you'll love it so much you'll never want to change it! It's the mother of all statement walls!